As I wrote recently, ten years ago I did my Leaving Cert. And while I mentioned many details of the day, one I didn't mention directly was my English exam. My Paper II's progress was eased dramatically by a question that could have been written for me (and I suppose, in a sense, it kind of was) in the poetry section: write a letter to Seamus Heaney outlining why you love his poems. Easy peasy. My favourite poem then, as now, is Valediction. And it was to this I immediately turned to when I heard the news that he passed away last week. It closes, "You've gone, I am at sea. Until you resume command / Self is in mutiny". Self is in mutiny. It's simply put, yet blisteringly evocative. It's Heaney all over. And on Friday, I was a bit lost at sea. It's an odd feeling, to miss someone you never physically knew, and yet I wasn't alone in feeling that. As news filtered through of Heaney's passing, my news filter was awash with people paying tribute, all of whom invariably posted their favourite poems of his as well. On a medium that's often noted for being shallow or frivolous, for Friday at least Facebook was a Xanadu of verse. 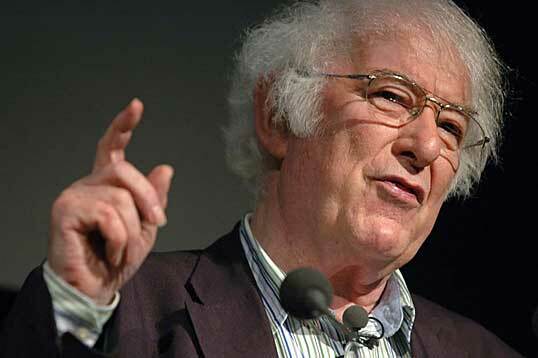 It's a mark of Seamus Heaney's talent and influence that he was able to do that, although small wonder. For people of my age, he's one of the big reasons any of us have a favourite poem at all. While still reeling from the passing of Heaney, on Sunday I heard yet more sad news: the passing of David Frost. Frost was one of a handful of people that I saw doing something, and how they did it, and knew I wanted to do it too. The range of the programmes he made was stupefying. He could muck about with comedians like the Pythons or Peter Cook, and also have the ear of some of the biggest names in world politics (he supposedly once greeted a former UN Secretary General with the phrase "Boutros Boutros Ghali, always a pleasure!"). He presented shows all over the globe at a time when TV was very much a domestic affair. His shows were responsible for both the classic Class Sketch with John Cleese and the Two Ronnies, and a game-changing interview with Richard Nixon. He even gave Through The Keyhole, a show involving snooping in famous people's houses, an unlikely gravitas. Referring to his habit for frontier-breaking, he joked about potentially doing a show from space, and kept his sense of humour throughout his life even when he was the biggest of shots. He made an impression on the world. Seamus Heaney and David Frost have both left this world. But while they were here they shaped it with loving craft. I'm very thankful for that.